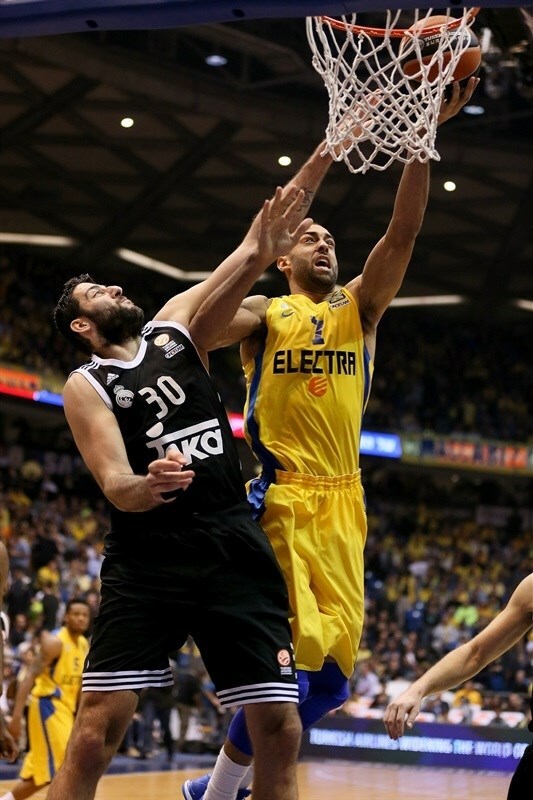 Reigning Turkish Airlines Euroleague champion Maccabi Electra Tel Aviv held on to beat Real Madrid 90-86 Thursday at Menora Mivtachim Arena in a rematch from last season’s Euroleague championship game. A dramatic clash came down to the closing seconds when Joe Alexander made clutch free throws for the hosts and Euroleague MVP Sergio Rodriguez committed a turnover for Madrid. The result left the two teams tied atop Top 16 Group E with 4-1 records. Sofoklis Schortsanitis dominated early and finished with 17 points and 8 rebounds for the champs. MarQuez Haynes also scored 17 on 5-of-8 three-point shooting. 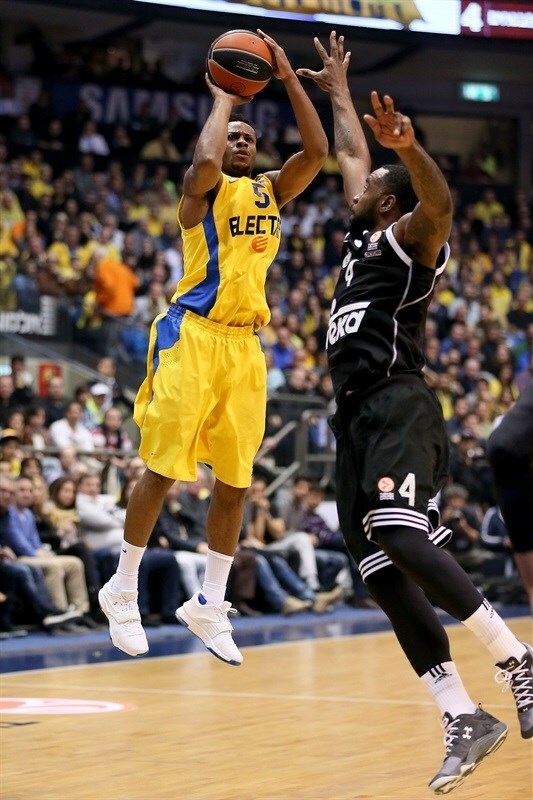 Sylven Landesberg added 16 points, Devin Smith scored 14 and Jeremy Pargo tallied 11 points and 9 assists for Maccabi. Felipe Reyes had another monster game for Madrid with 20 points and 11 rebounds. 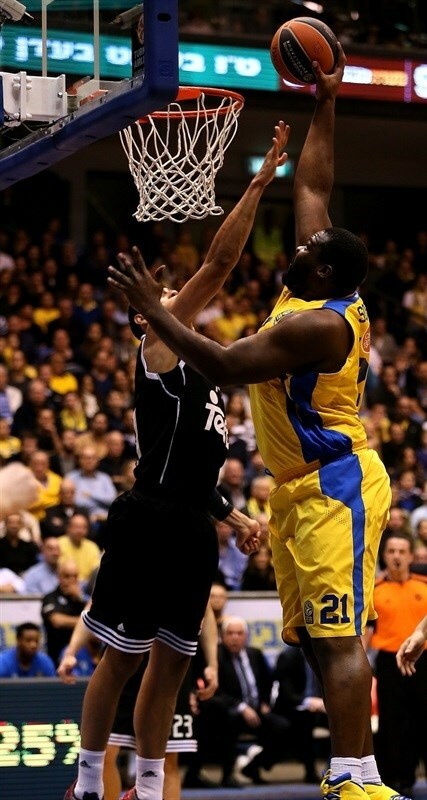 He became the Euroleague’s career rebounding leader with his final rebound in the closing seconds. 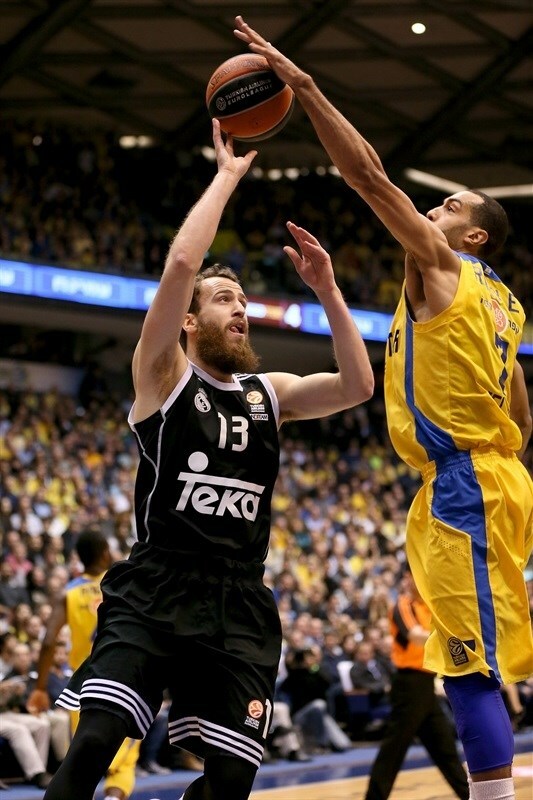 Gustavo Ayon added 13 points and Sergio Llull 11 in defeat. Madrid won the opening tip and Ayon scored from point-blank range. Schortsanitis responded with a slam at the other end. Llull added a three and Rudy Fernandez found a cutting K.C. 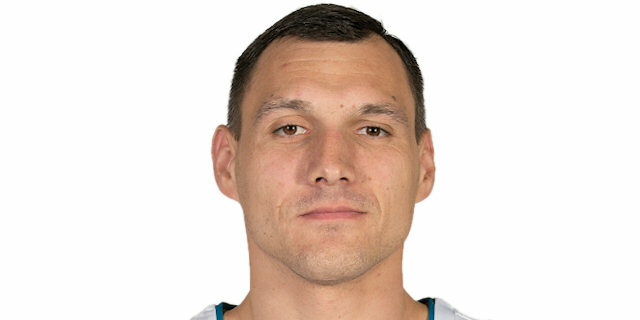 Rivers to make it 2-7. 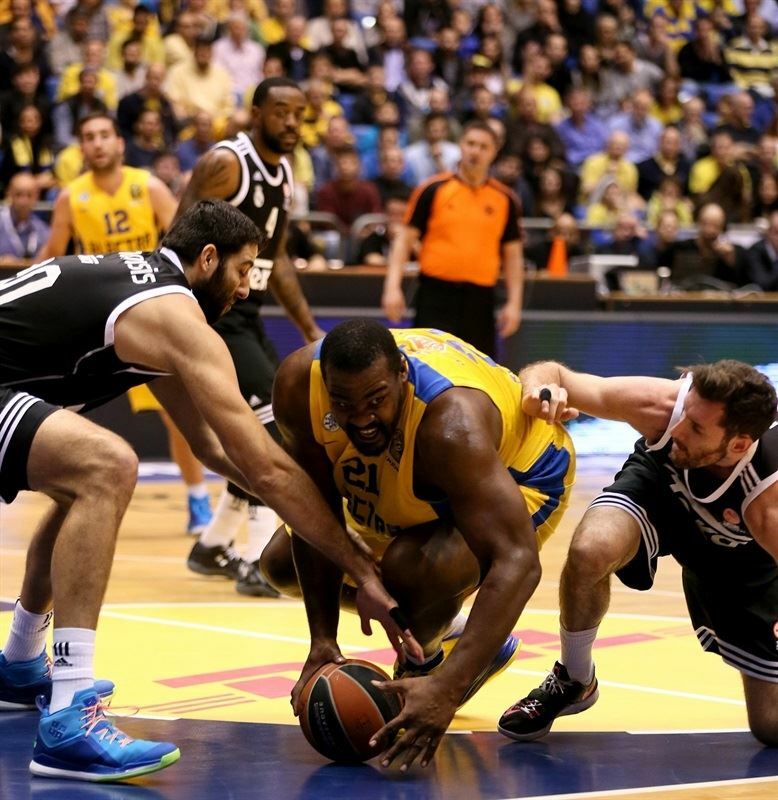 Maccabi continued to look for Schortsanitis, who committed an offensive foul on one possession and a three-point play on the next. Brian Randle dished to Smith in transition for a slam to even the score at 7-7. Llull and Reyes sandwiched triples around another bucket from Big Sofo. The Maccabi center reached 10 individual points with his second three-point play to make it 12-13. After Ayon hit a mid-range jumper, he made way for Bourousis. Reyes scored on the offensive glass and Bourousis put in a jump hook and foul over Alex Tyus to make it 12-20 midway through the quarter. 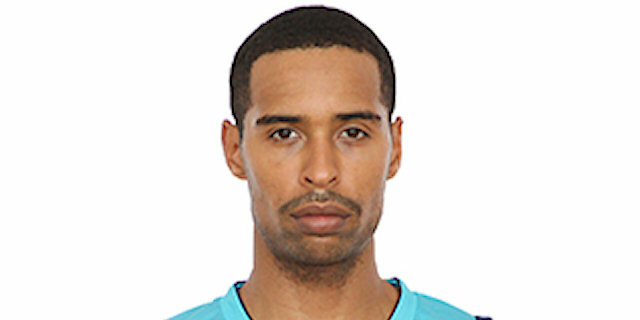 Smith scored twice around a Reyes tip in. Bourousis scored again on the offensive glass and Reyes added another bucket. Pargo got 2 back for Maccabi from the line, but Bourousis’s jumper made it 18-29. Landesberg nailed a three from the corner, but the momentum remained with Las Blancos as Sergio Rodriguez fed Bourousis for a slam. Pargo split free throws to make it 23-31 after 10 minutes. Haynes connected from downtown to the delight of the Maccabi crowd. Then Pargo threw down a wicked slam in transition to make it 28-31. Rivers assisted Andres Nocioni for a dunk at the other end. Schortsanitis got to the line 4 more times, but only sank 2. Rodriguez went into traffic for a layup, but Landesberg’s second triple made it a 2-point game. Haynes pulled up from behind the arc to put Maccabi up 36-35. Marcus Slaughter made the most of a three-chance Madrid offense with a dunk and Jonas Maciulis added a jumper as the visitors took a 36-39 edge midway through the quarter. Reyes’s clinic continued with another basket on the offensive end. Jaycee Carroll netted a pair of floaters to complete a 0-10 Madrid charge. Landesberg banked in a shot, but Ayon scored seconds later. Schortsanitis’s put-back kept the hosts in the picture, but Reyes sank free throws at the other end. 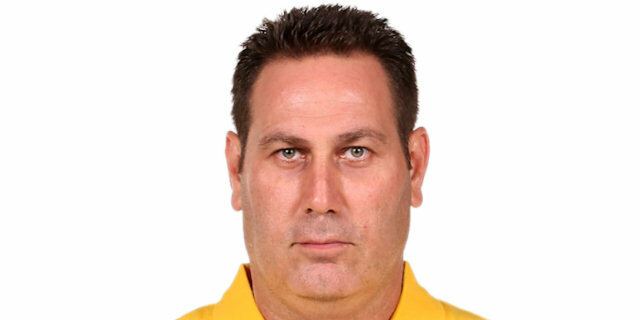 Joe Alexander got in the books for Maccabi with a three from the corner, but he then fouled Reyes, who sank 2 more foul shots. Carroll restored a double-digit Madrid lead,43-54, with a three in transition. Haynes drained another three to bring Maccabi within 46-54 at the break. Randle opened the second half with a spin move for a basket and foul. A minute later he went coast to coast for a slam to ignite the Maccabi faithful. Smith added free throws to bring the hosts within 2. Schortsanitis drew a fourth foul from Bourousis, After missing both free throws, he got the rebound and scored to tie the game at 54-54. Rudy’s high-arcing jumper put Madrid back on top and the Madrid swingman added a three from the corner. Haynes remained perfect from downtown with a fourth three to make it 57-59. Ayon used a nifty move to keep Madrid in control. Smith and Reyes traded baskets before a Llull jumper gave the visitors a 59-65 lead midway through the quarter. Rivers hit a baseline jumper. Haynes drew a foul shooting a three and made 2 of the resulting shots. Pargo sank a three to bring Maccabi within 3. The Landesberg scored on the offensive glass to make it 66-67. Pargo found Landesberg on the break for a layup as Maccabi regained the lead. Nocioni’s put-back left Madrid up 68-69. Haynes’s brilliant shooting continued with another three. Rodriguez found Slaughter for a layup to tie the game at 71-71. The tension reached new heights at Menora Mivtachim Arena. 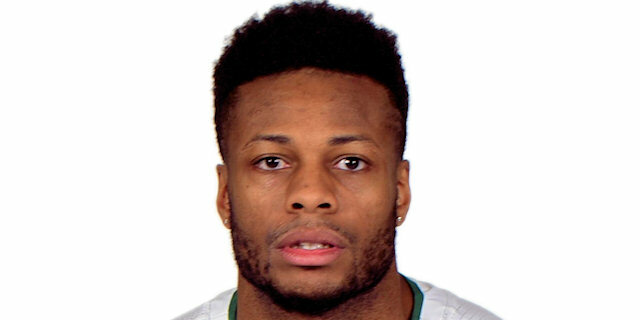 Pargo found Landesberg on consecutive possessions; the first an inbounds play and later in transition. After Maciulis tipped in Carroll’s missed three, Pargo fed Alex Tyus for a crowd-pleasing alley-oop slam. Tyus put Haynes’s missed three in to make it 79-73 with six minutes to go. 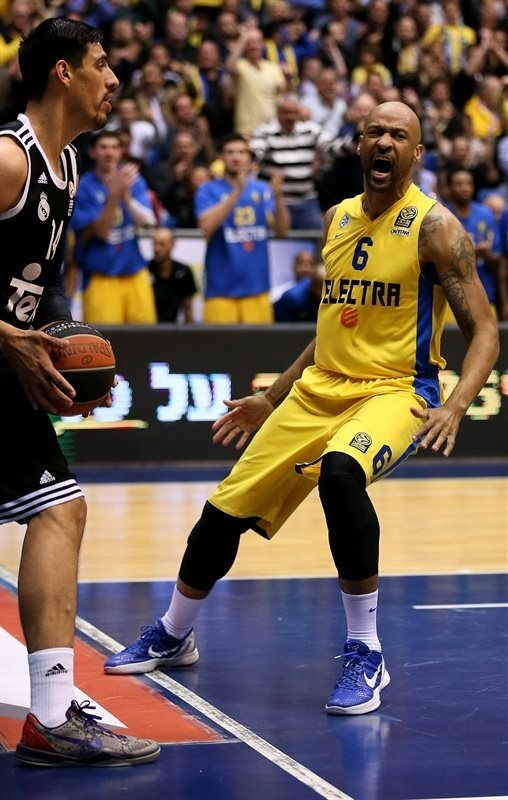 Pargo banked in a shot to cap a 10-2 Maccabi run. Ayon scored twice to narrow the gap to 4. A series of missed shots and turnovers at both ends brought the teams close to the two-minute mark at 81-77. Randle soared for a layup, but Reyes scored once again on the offensive glass. Rodriguez bettered Smith with a triple to make it 85-82. Pargo split free throws with 52.4 second to go. Ayon split shots from the charity stripe 10 seconds later. Smith drove into the paint and sank a floater for an 88-83 advantage with 24.7 seconds left. Llull drained a three to keep Madrid in it. Madrid fouled Alexander quickly and he converted his first 2 Euroleague free throws for a 4-point lead with 14.7 seconds on the clock. 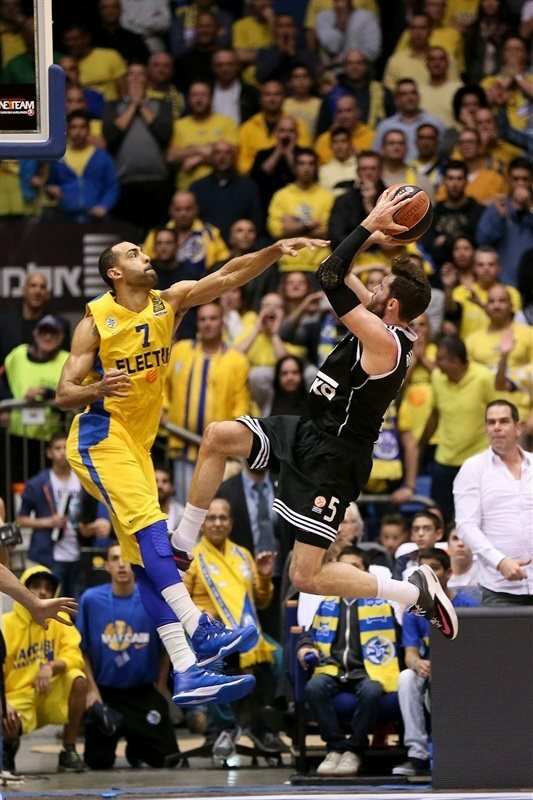 Rodriguez’s ill-timed pass went out of bounds with 7.8 seconds left and sealed a Maccabi win. "It was a very difficult game, and we knew it would be before the game. This is a team that can score a lot of points, like we saw in the first half. They are excellent with rebounds. Also we made a lot of mistakes with offensive rebounds where we missed out on a lot of points. At halftime I spoke to the players and I told them we need to rebound and block and guard like we know we can. And the guys stood up to this task and we won in the end. This was an important win; it is important to get the home wins. But I don’t look too far forward. 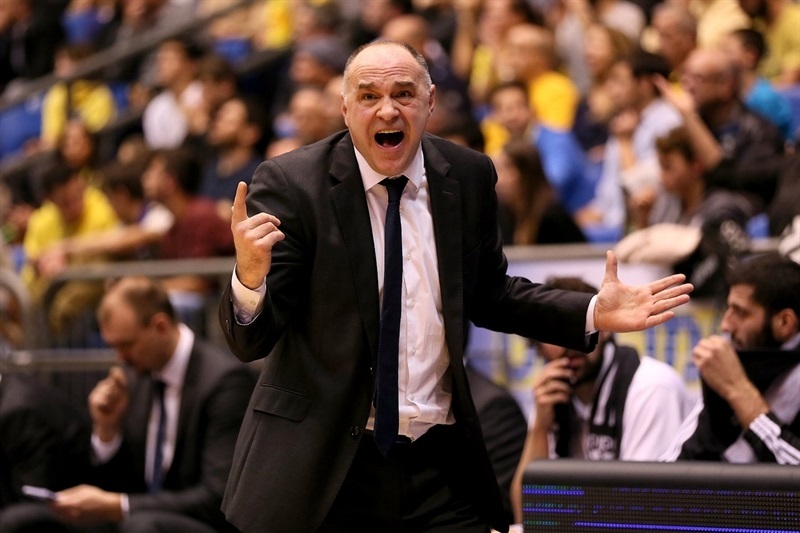 I have seen many things happen in the Euroleague and the Top 16. So you need to take it game by game and collect wins. Two wins over Barcelona and Real Madrid at home is a big bonus. But we have to carry on working hard. " I would like to congratulate Maccabi. I think it was a very good game of basketball. We did good things to stay in the game – rebounding, passing. We missed some easy shots, but we were able to come back into the game. And when they had an 8-point advantage, we were able to come back into the game again. A lot of times these kinds of games come down to details – details in the 40 minutes, not just at the end. I am not happy, of course, but I know how hard the Top 16 is. We knew what Maccabi could do here. We have to try and forget about this as quickly as possible and think about the next game. "At halftime the coach came in and told us it’s either us or them and we’ve got to toughen up – battle down on the offensive glass and just buckle down on defense. I felt like the second half was a totally different game to the first half. We took control and finished the game off the way we wanted to. It was nice to play out there – the fans did a great job. Even when we were down in the first half they were right there with us and it is just great support to have. I feel like this team has so much more potential. I feel like every game we are getting better and better, and we are getting contributions from different people. So we need to keep growing as a team." "It was important for the team that everybody just played a little bit tougher, a little bit harder, and I think that’s what we did [in the second half]. We had a good game plan as well. We are going in the right direction so we need to keep it going. We got a couple of big wins so we need to keep playing hard, keep pushing and keep getting better. I don’t think it was a statement game for me. Maybe for people that don’t know me, but I know what I am capable of doing. I can still play a lot better – it’s a process, it’s a progression. " 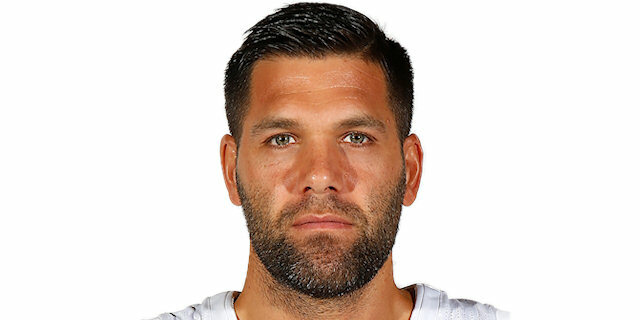 "We played a good game today, but we played a bad third quarter. They played better than us in this quarter but I think the game for us was good. They are always tough games when we play here against Maccabi and it is difficult to win them, but at home it will be different, for sure. I am now the top rebounder, but today we lost. It is a great day for me, but I want to work hard every day to be better at rebounding." "The game was really intense and we had a great first half. I don’t know what happened. They started playing a bit more aggressive defense and they used it well at the correct moment. There’s no weak teams in the Top 16 and Maccabi played at home with great fans, which is like one extra player. It’s tough to win here and we know this – I’ve played here many times before. But nothing is over and we will continue."